Messy Messy Fail - I save all the gift bags we receive to reuse for another gift. If you ever need a baby boy gift bag, come shop my collection. If you can get to it, that is. A giant pile in the basement corner that has crawled out of the original two plastic containers I started organizing them in. Another thing to add to the list. Tidy Victory - I wasn't feeling so hot today, but I was still able to sort out and organize under the sink and our old school medicine cabinet in the downstairs half bath. I threw away so much expired medicine - mixed the pills in with coffee grinds of course - and old bottles of gunky nailpolish in hideous colors. How did I ever wear those colors?!?!?! A few weeks ago we went to a St. Patrick's Day party at a co-worker's house. 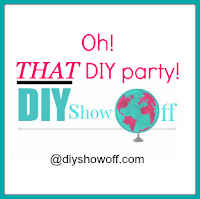 Fabulous party - they provide pizza and beverages, every guest brings a dish to pass. I decided to bring one of my easiest go to appetizers - Buffalo Chicken Wing Dip! Now of course, you can ONLY make this the right way and appreciate it fully when living in Western New York (wink wink). 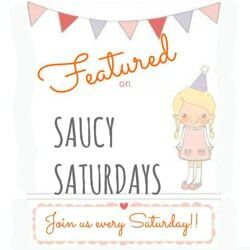 I originally received this recipe from my SIL, and with a few slight changes we made it our own. This is such an EASY dip, so satisfying if you are into spicy things. You can make it in a casserole dish or a little crock pot like mine. By the way - this mini crock pot was given as a wedding shower gift from one of my husband's cousins. It was not on my registry - stupid me - but BOY was I glad she had the smarts to know I would need and LOVE this thing. Thanks Stacey! First things first - soften your 2 blocks of cream cheese. 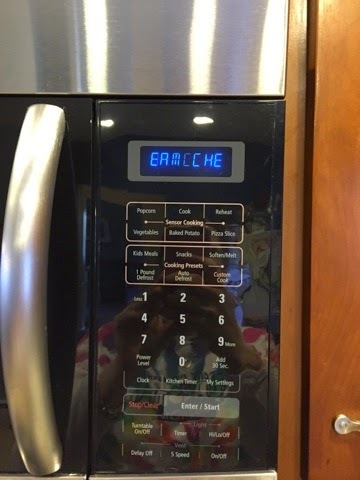 If you are lucky like me, your microwave may have a "soften cream cheese" setting, at which point you turn that baby on. 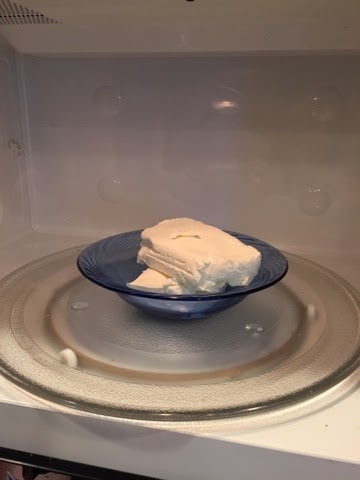 If not, maybe zap your cream cheese in a microwave safe bowl for 20 seconds at a time until it's nice and soft (not liquid!). 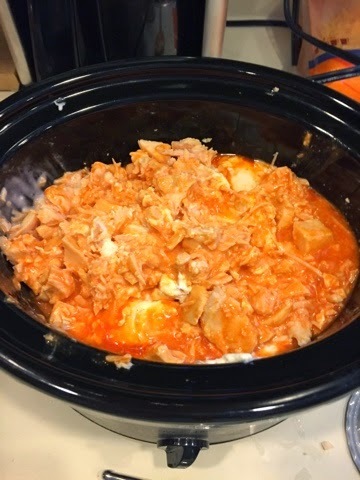 I chose to use my crock pot for the party - would help to keep the dip warm throughout the night - so after your cream cheese is good to go, put that and 8 oz. 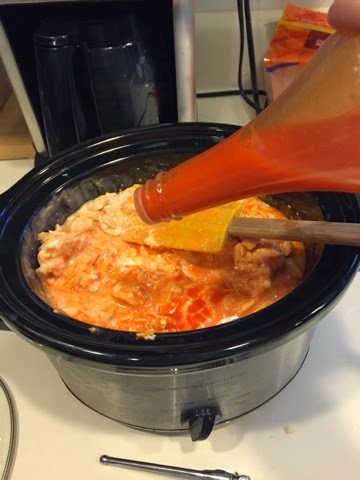 of your chosen hot sauce into the crock pot. Chicken time! I've seen recipes where people use rotissiere chicken or boil a whole chicken on the stove top then pull it apart. I can't be bothered messing with that, and I think it tastes better this way (maybe it's the sodium, who knows), but I use two large cans of chicken. 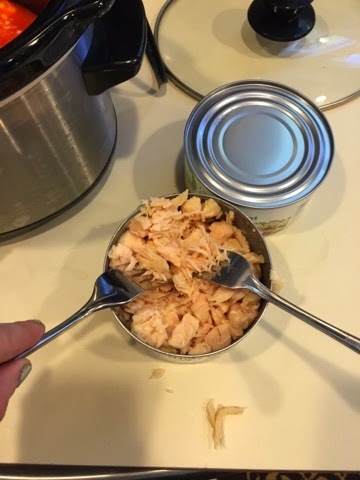 Pop the lids, drain, and use a couple of forks to break the meat up. Dump the forked up chicken right into the pot and give it a good stir. Next, please add a 1/2 cup of ranch dressing and a 1/2 cup of blue cheese dressing for even more flavor. A few extra dashes of hot sauce won't hurt, either. Stir, stir, stir! At this point, I like to put the lid on and turn my dip on low (or high if I am at a loss for time) to get everything melded together. Finally, after a few good stirs and you have a beautiful bright orange dip bubbling away, I like to sprinkle 6 oz. 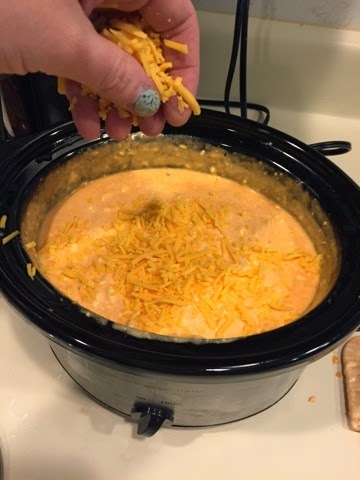 or a little more of shredded cheddar on top for an added layer of gooeyness. 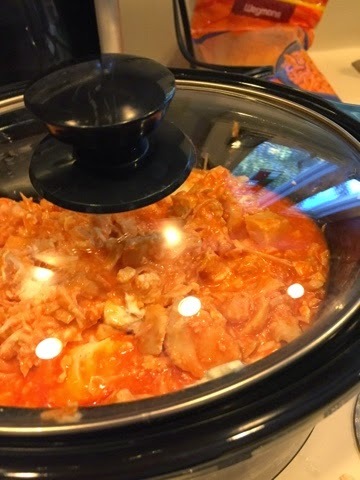 If you don't have a cute mini crock pot, you mix everything into a 9 x 13 casserole dish and bake in a 350 degree oven for about 30 minutes until the dip is bubbling away. 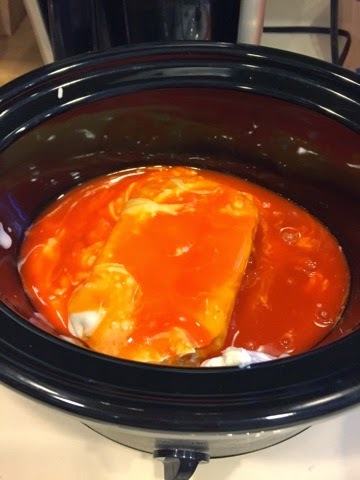 Pull the dish out, sprinkle on the cheese, and put back in the oven until the cheese is melted. I like to serve this dip with some type of tortilla chip, preferably Tostitos Scoops to get lots of chicken. 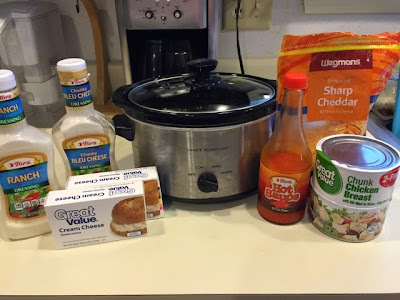 My absolutely FAVORITE way to eat this dip, surprisingly enough, is cold! I love taking any leftover dip from the fridge and digging right in. Always a hit at the party, the proof will be in the empty container. 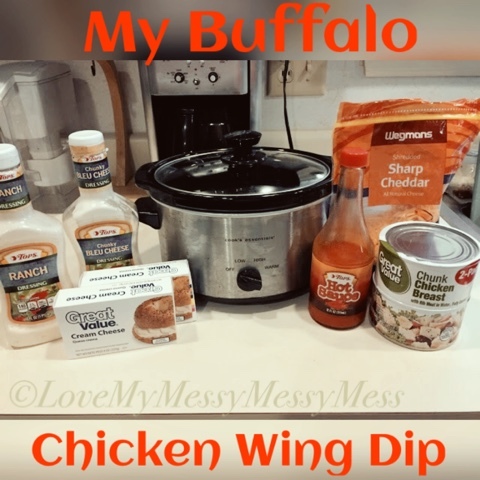 I hope you enjoy my go to party appetizer, this is what Western New York taste's like! Messy Messy Fail - Let's just say the cats have been making sure to keep themselves clean, but you know what that means for our furniture and floors then. Gross. I picked up some hairball prevention gel at Walmart, hope this stuff works because I'm sick of getting out the Bissel machine! Tidy Victory - After two weeks of trying on about 982349823498 pairs of frames, taking selfies with them on and sending them to my mom and sister, I picked out my frames! Got all of my measurements done, ordered the lenses, and MAN is it nice to be able to see again. My poor orchestra students would get so confused when I'd give them a measure number to start at in their music during rehearsal and they would say, "Uh Mrs. D. that is nowhere near where we just were" or "That makes no sense Mrs. D, there is no rehearsal W in this piece". I like to keep my students on their toes. 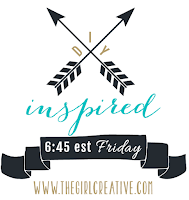 Is anyone else having issues coming up with a creative project that is NOT already on Pinterest? I mean seriously, it appears that almost EVERYTHING has been done. Therefore, my goal for this post was to come up with an original-as-possible St. Patrick's day craft. I do not have many shamrock decorations for this holiday, so why not? And who cares if St. Patrick's day has already passed? 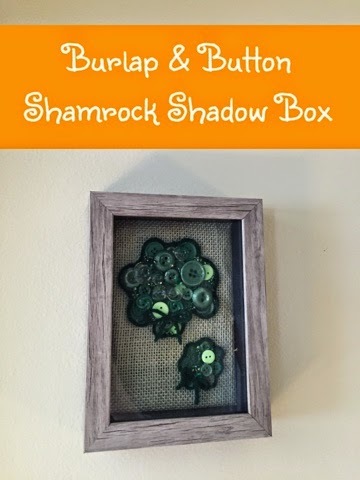 Using the backing of the shadow box as a template, I used scissors to cut two rectangles from the green burlap to serve as the backing inside the shadow box. *Trick I learned from the nice young lady at Joann's - if you use a stitch ripper to rip and pull one thread out of the burlap where you want to cut, it creates a straight clear space to follow with scissors and helps keep the cut straight and prevents frays! Next, I used the hot glue gun to glue both burlap rectangles to the inside backing of the shadow box. I highly recommend crafting with a nice glass of vino, makes the whole occasion more peaceful. I used two because the inside of the shadow box was that black velour and I didn't want that to show through the burlap. After glueing the rectangle burlap pieces inside the shadow box and allowing to dry for a few minutes, I used my scissors to trim any excess burlap and made sure the backing fit back into the shadow box - nothing worse than a frame that won't securely close! Time for the shamrocks - I just happened to have two shamrock cookie cutters - a medium size and a small size - that I set on the burlap to make sure I approved of the placement. After I was happy with that, I started carefully adding the first layer of buttons inside the cookie cutters on the burlap. That way I could make sure the buttons fit before gluing them. After I had a layer of buttons, I carefully removed the cookie cutter and starting gluing the buttons down. I made sure to place my dot of glue on the burlap - not on the button - to make sure I would put the button down in the right place. I kept a scrap of burlap handy to help keep the hot glue drips and strings to a minimum. Be sure to let the glue from the first layer dry before starting the second. I also made sure to use the more plain buttons for the first layer since it would not be seen as clearly as the second. I glued one layer of buttons down for each of the shamrocks, now time for the second layer. I put the shamrock cookie cutters back over the buttons as best I could to help maintain the correct shape. They certainly did not fit perfectly - a few buttons were glued slightly out of place - but the idea is to keep it as true to the shape as possible. I used more decorative buttons for the second layer, and rather scattered them to cover any burlap that was showing from the first layer still. Again I removed the cookie cutter and put dots of glue on top of the first layer of buttons where I wanted the second layer of buttons to go. The container of buttons I purchased also came with a small container of tiny green beads and gems to be used to fill in the holes even more with a touch of sparkle. After the second layer of buttons dried, I put some dots of glue in small crevices or around buttons to help keep the shamrock shape and used my finger (don't burn yourself!) to push in the small green beads and gems into the glue. Always be sure to keep your shamrock shape close by for reference. 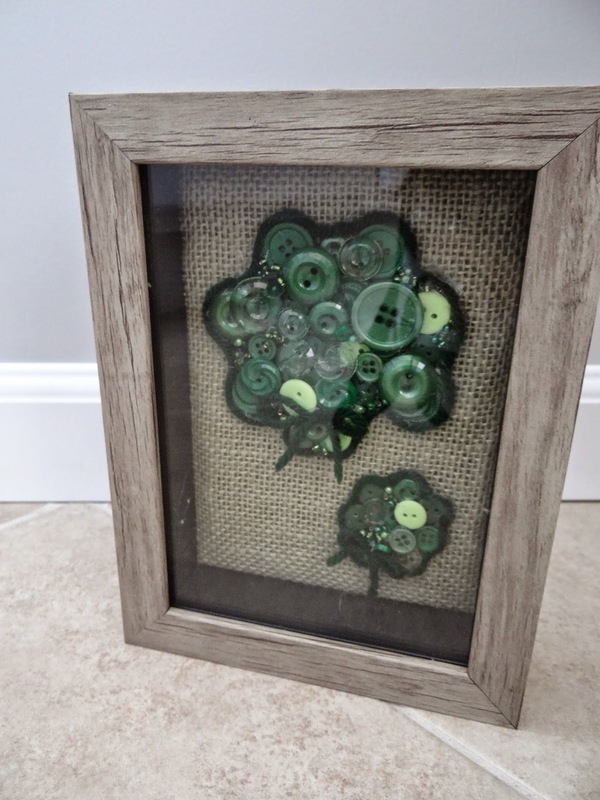 At this point, I was quite pleased with my ORIGINAL work when I realized that my green button shamrocks could be mistaken for just a pile of green buttons I had glued together - aka it was tricky to see the shape. Game time decision - I purchased some inexpensive dark green yarn to glue around the shamrocks to help define the shape more. Before gluing the yarn around the buttons, I quickly ran the yarn around the shape to make sure I cut enough yarn for each shamrock. I also left enough excess to tie a cute bow - I LOVE BOWS - on the bottom of each shamrock. After I cut the yarn, I simply ran a tight bead of glue around 1/3 of the button shamrock then just used my finger (no burns please) to push the yarn right onto the glue neatly around the shamrock. Clearly time to change my jams, those babies lasted more than 2 weeks! There were still a few bare spots so I put in a few more dots of glue with some more tiny beads - cute! When I got to the stems of the shamrock, I tied the ends in a cute bow and but a dot of glue underneath the knot to secure it to the buttons. 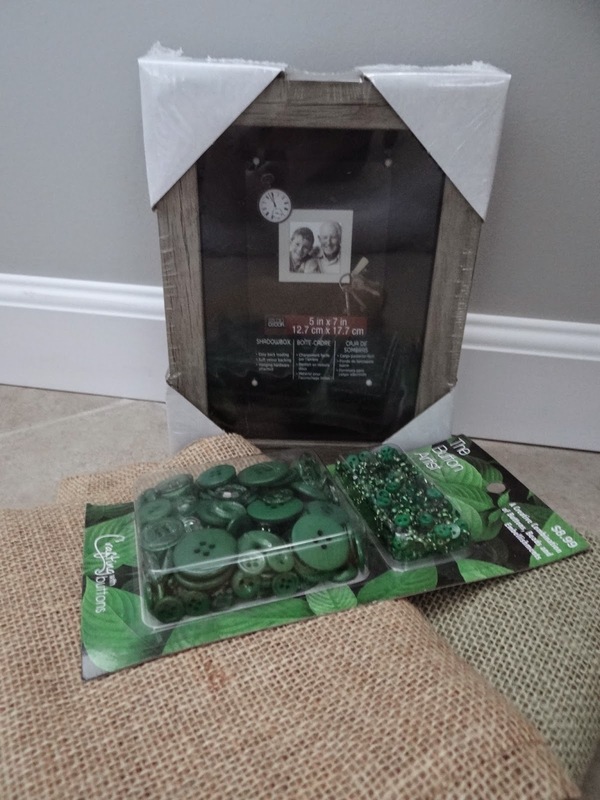 Time to see my finished project - after I let everything dry, I put the burlap backing with my cute shamrocks back into the shadow box, secured the sliders on the back and enjoyed my new St. Patrick's Day decoration! Bad glare but you get the idea! 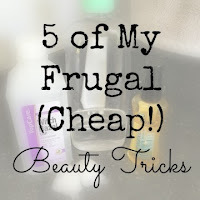 Phew, it's tricky coming up with an ORIGINAL craft project! There are always some unexpected issues that may come up, but that's a good lesson in problem solving skills, folks. I hope you had a fantastic St. Patrick's Day - three weeks later - and get here quickly Spring! Tidy Victory - Ahhhh just went shopping today and Easter baskets for the boys are done, phew! Putting together a Paw Patrol basket for the toddler and Thomas the Train for the baby. Messy Messy Fail - The poor baby follows the toddler around and plays with his toddler toys. Chews on puzzle pieces, throws Mega Blocks, pushes around Hot Wheels. As the toddler was getting older, we packed away his baby toys in tubs in the basement but then forgot to get them back out for the baby. Whoops. Maybe playing with toys for older children will make him more advanced. Tidy Victory - Did you know that if you call the credit card companies and catalog/magazines you receive junk mail from, they'll take you off the mailing list and STOP SENDING IT?!?!?! I'm insane about recycling - I think it drives my husband crazy - I'm always gathering piles of paper, plastic, glass and metal to put in the recycling containers we have in the garage. I even save my yogurt containers from school, rinse them out and bring them home to recycle. So getting less junk mail = smaller paper recycling pile = happy husband. In contrast to my last long post filled with pictures and details, I'd like to post a short list of randomness that I have been thinking about today on this first day of Spring. I thought this day would never come. Not that I didn't enjoy all of our winter snowmobiling and such, but it really was a cold one. My school district had one snow day and three cold days, as in the wind chill was at least 15 below zero and not safe for kids to be walking to school. Having this many days off due to inclement weather NEVER happens in my district, so that says something about how brutal our winter was. <One> Melting - We have had several days of temperatures above 40 degrees, which means that the 4+ feet of snow we had has turned everything into a lake/pond/mud. Winter boots have been exchanged for galoshes. Melting snow means finding interesting things around that have been lost in the snow and presumed gone forever. Until now. 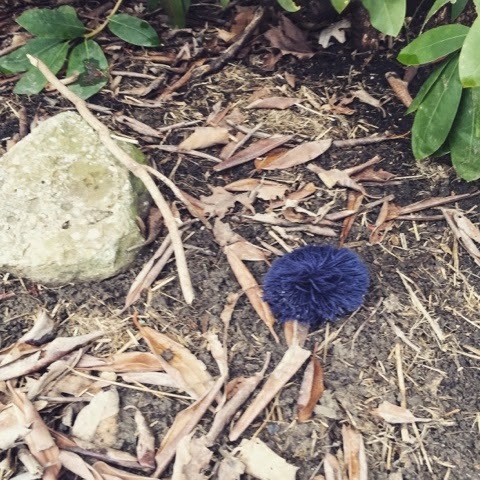 Like the blue pom-pom that came off of my husband's hat when he was putting up Christmas lights. We meet again pom-pom! Now I just have to figure out how to sew it back on. Located directly underneath the rhododendron bush in our front yard. <Two> Musicals - If your local districts are anything like ours, this is prime time for musical season. If you are looking for some inexpensive entertainment that supports your local schools, try looking in the paper or at the district websites to see when their musicals are scheduled for. Chances are you will be highly entertained and and impressed to see what some talented teenagers are up to these days. My district is performing Bye Bye Birdie, and I've got my ticket and babysitter lined up for Saturday night! 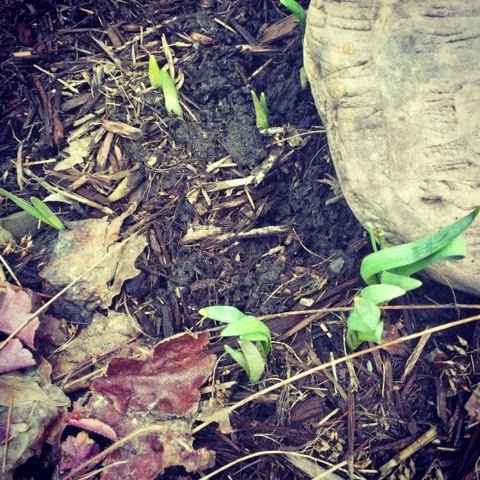 <Three> Gardening - I let out a shriek of excitement when I happened to see my daffodils already starting to poke out of the dirt. 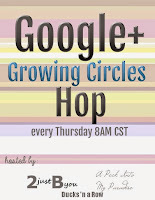 I know it is still a ways off, but I'm so excited to see what comes up this year. I planted a TON of bulbs & tubers last fall - peonies, poppies, some sort of tree from Nana Patti and the Lord only knows what else - and it's so fun to watch little sprouts come up and try to figure out what made it and what didn't. 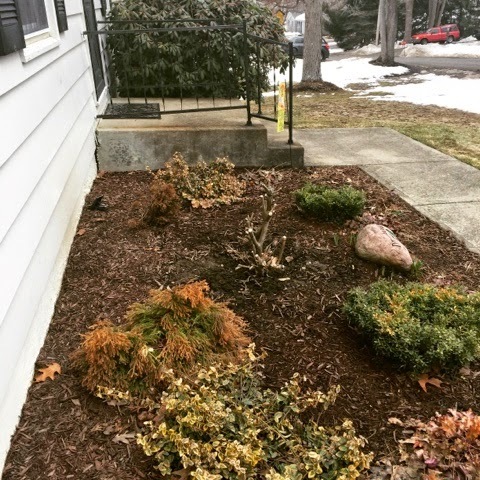 We had a large holly bush in front of our house that we lost last fall (moment of silence), not sure what happened, but it needs to be ripped out and replaced. What should we put in place of it? 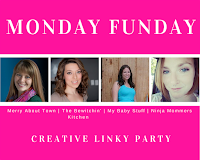 <Four> Party Planning - The baby is turning one and we love to plan a big first birthday. 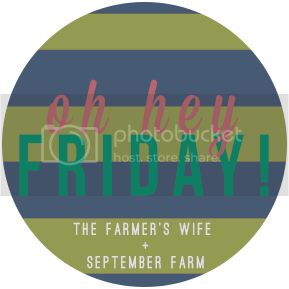 Our theme is going to be Mickey on the farm with a picnic type menu and lots of farm goodies. To save some money I made the invitations myself but am having a cute birthday made from an Etsy shop. I will not be going too overboard, but I like to have some cute centerpieces and of COURSE a cute cake (that I will not be making, too much pressure). I'll be taking pictures throughout the process and posting about it after B-day has been completed. <Five> Dog Tag - The dog's new FREE (only paid for shipping) tag from Shutterfly arrived in the mail a few days ago and I figured out how to put it on her collar today (needle-nose plyers). I think she really likes it and I really like Shutterfly! 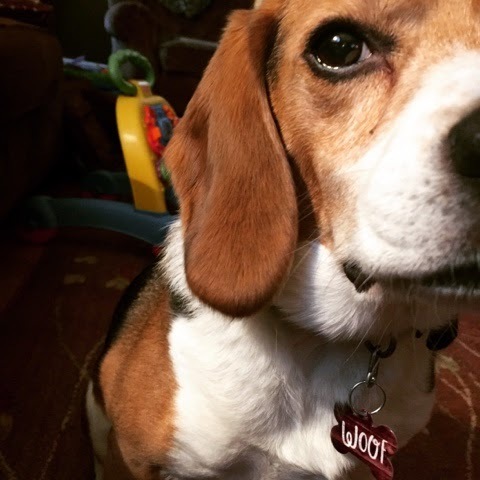 Her name is Sadie, not Woof, her name and our phone number is on the other side. 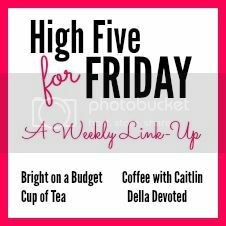 Thanks for reading my randomness today and enjoy your weekend everyone!